This Ant World is very similar to Baby Player mod but now the mobs will be very small around you. Also, smaller mobs have fewer health and is much weaker than before. It's very cool when a crowd of little zombies attack you. Now, you can download the Smallest House mod and reduce the size of your home in a few times. Then install the Baby Player mod and feel like Lilliputian. Especially it will look cool in a big city :). 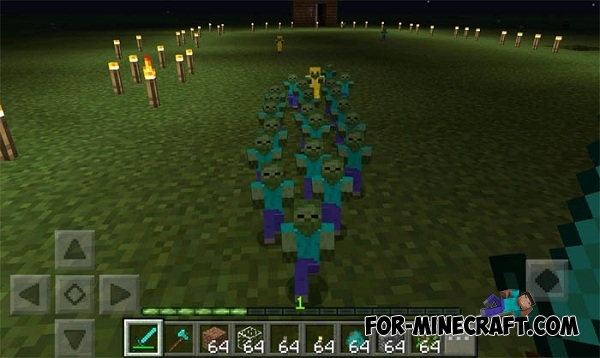 Mobs are moving like before. Build a small cage and spawn different mobs in this place. It looks simply amazing, especially when they are fighting with each other. Thus it is possible to build an entire city and to arrange life for them. How to install Ant World mod? Create a "resource packs" folder in "games / com.mojang /" after downloaded the mod. Extract the mod from archive in the "resource packs". Then go to settings, global texture and select the downloaded mod. After that, you definitely need to restart MCPE. Smallest House mod for Minecraft PE 0.15/0.16.0Here is a very funny mod which makes a very unusual change. By installing Smallest House mod you get a completely different house..
Alleron City map for Minecraft 1.8Here is one of the largest cities ever created in Minecraft.